God delivers water from the rock to the grumbling Israelites. *Tune In / ATAR663 Save us in the time of trial (Whelan) A song with a reflective almost-Taize-like chorus. We have sung this a cuople of different ways, it's quite flexible. I will suggest this quite a bit during Lent. Lyrics, sound sample and songbook available. **GtG053 O God who gives us life (Daw) Excellent words of God providing living springs of hope, and the need for us to face our fears and follow God through difficult times. An excellent fit for this reading. Straightforward hymn tune (NOEL). New words to old tunes. ATW 435 Wellsprings / Like the woman of old. Another song of seeking water in the desert. 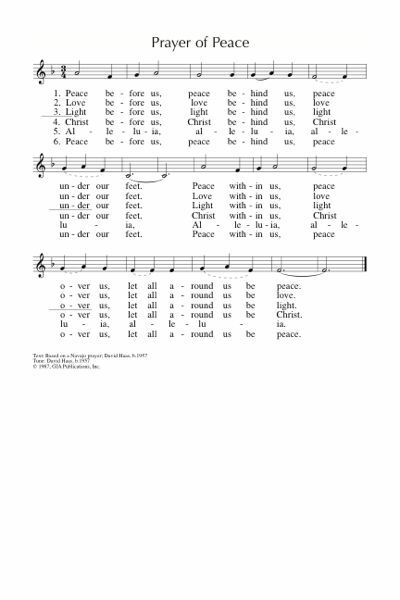 A favourite of our congregation; can be tricky to sing if it's not familiar. Lyrics. NCH045 Christ is the Mountain of Horeb which is flowing / Cristo es la pena Puerto Rican pasodoble folk melody. Very repetitive and easy. Can start slow and get fast, which is always a winner move. We have not sung this for a while. Youtube of some cool pianist doing a groovy jazzy version. Good for kids. GC840 / GC(II)818 / G(3)910 / CP085 / 82Hml-343 Shepherd of souls refresh and bless (Mongomery) Old fashioned inclusive words to a standard hymn tune. "Shepherd of souls refresh and bless thy chosen pilgrim flock, with manna from the wilderness and water from the rock". *Linnea Good Stand on the rock Simple gospel chorus. This would be a good intro to worship, or be sung by a small vocal group as the Bible is brought forward and the candle lit. The congregation could join in once it has been sung a couple of times. *MV092 / SP&P099 Like a Rock (Wehlander / Good) A lovely simple song (with actions!) from Linnea Good. Great for kids. PH215 / URW292 Come Sing with Joy to God (Duba) Good lyrics to the well known tune DARWALL'S 148th. Lyrics. Emergent Psalter Come let us sing (Everett) Very simple refrain. Sheet music (refrain only). AoVK-123 / NCH3 / Iona (M&G) / UMH148 / VU308 / WoV794 / ELW837 / GtG021 / PH271 / G(II)338 / GC499 / G(3)911 / CP407 / W&R26 / Cha58 / URW232 / 82Hml-385 Many and Great O God are your works / Wakantanka Taku Nitawa (Lacquiparle) Good words. Simple tune. Sounds great accompanied by a good Native American-style drum beat, which is a great way to get people involved in music-making. Lyrics here. Cha747 Come into God's presence with a joyful song (Sivis) Joyful sung response, and responsively read passage. Taizé / MV009 O Come and let us sing to God our hope (Taize) Joyful gathering chant. Sound samples, sheet music. PfAS095E / Lau52a O that today you would listen (Sayers) A nice Psalm response. *MV117 By the well a thirsty woman (Stilborn) An excellent song that brings this story to us, with words of Christ being our source of living water. The tune will probably need to be taught. TiS 693 / AoV1-031 / GA212 Come as you are that's how I want you (Browne) This song is beautiful, gentle, simple, and very well known. Lyrics (search for "come as you are"). Slow and mushy youtube. A good song to start the service. VU471 / W&R692 / URW122 / StF582 Eat this bread and never hunger (Damon) Very simple tune. The first verse refers to this passage. Particularly good if you are celebrating communion this week, but will be fine if you are not. I will suggest this song again next week and the week after, so this is a good week to introduce it! *Taize / MV102 / GC(II)648 / G(3)752 Jesus your spirit in us (Taize) "Jesus your spirit in us is a wellspring of life everlasting" Lyrics in English and German. Sheet music sample. Very very slow sound sample. You know, Taize music is not necessarily slow. When one of the brothers visited here, he strongly encouraged us not to be so slow! CH348 / StS001 / LBW196 / ELW843 / A&M762 / G(3)625 / CP397 / W&R93 / SP304 / URW090 Praise the One Who Breaks the Darkness (Edwards) Good words of Christ's ministry to all. Can be sung to the familiar tune NETTLETON, or the less familiar and very lovely tune JOEL. I will suggest this again next week! Lyrics. New words to old tunes. StJ / GtG048 / GC(II)505 / W&R444 / G(3)582 / URW144 / Srce2-502 Rain Down (Cortez) A good simple gospel song. A very easy chorus, and good verses too. *Folk song Jesus met the woman at the well (Traditional) An old folk song - a storytelling song. Here's an old movie of Ian and Sylvia Tyson doing a good old version of it. And here's Nick Cave, which I like better, except the ending. Oh, and how about Rev Cleophus Robinson? I think that's the best one! It would be cool to play this. What will you be singing? Add a comment, especially if you'd like to share something I haven't thought of! "Come to the Water" John B. Foley, S.J.